Q3. Describe the Global Poverty Scenario (trends ). (i) The Proportion of people in developing countries living in extreme economic poverty defined by the World Bank as $1. 90 per day has fallen from 43% in 1990 to 22% in 2008. (ii) Poverty declined substantially in China and southeast Asia countries as a result of rapid economic growth and massive investments in Human Resource Development. (iii) In countries of South Asia (India, Pakistan, Bhutan, Sri Lanka, Nepal, Bangladesh) the decline has not been as rapid. (iv) In Sub-Saharan Africa, poverty in fact rose. (v) In Latin America, the ratio of poverty remained the same. (vi) Poverty has also resurfaced in some of the former socialist countries like Russia. Q4. 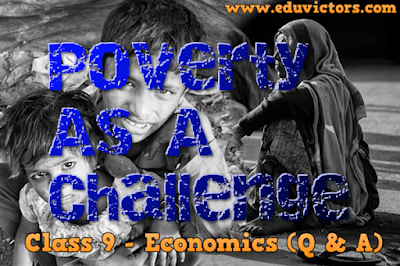 Critically examine the results of the Poverty Alleviation Programme (PAPs). Give reasons for less effectiveness of PAPs. (i) Poverty has certainly declined in India but despite good intentions, the benefits of these schemes have not fully reached to the deserving poor. (iii) There has been a lot of overlapping of schemes. Q5. Discuss the major reasons for poverty in India. • The policies of the colonial government ruined traditional handicrafts and discouraged development of industries like textiles. • This resulted in a low growth rate of income and fewer job opportunities. The low rate of growth persisted until the 1980s. This resulted in fewer job opportunities and the low growth rate of income. This was accompanied by a high growth rate of population. The two combined to make the growth rate per capita income very low. With the spread of irrigation and the Green Revolution, many job opportunities were created in the agricultural sector. But the effects were limited to some parts of India. The industries did provide some jobs. But these were not enough to absorb all the job seekers. Unable to get proper jobs in cities, many people started working as vendors, domestic workers etc. They started living in slums on the outskirts of the cities, thus added to urban poverty. redistribution assets in rural areas is also responsible for poverty. In India, people borrow money to fulfil social obligations and observe religious ceremonies. People in India, including very poor, spend a lot of money on such social functions. Small farmers need money to buy agricultural inputs like seeds, fertilizers etc. Since poor people hardly have any savings, they borrow. Unable to repay because of poverty, they become victims of indebtedness. Q6. Discuss the current anti-poverty strategy of the government. What are the two planks undertaken by the government to alleviate poverty? ✦ Economic growth widens opportunities and provides the resources needed to invest in human development. ✦ This also encourages people to send their children, including the girl child, to schools in the hope of getting better economic returns from investing in education. ✦ Moreover, in India, a large number of people are dependent on agriculture for their livelihood. Hence, growth in agriculture will have a direct impact on poverty reduction. ✦ It aims to provide 100 days of wage employment to every household to ensure livelihood security in rural areas. ✦ One-third of the proposed jobs have been reserved for women. ✦ The average wage has increased from 65 in 2006-07 to 132 in 2013-14. ✦ Under the programme, if an applicant is not provided employment within 15 days, he/she will be entitled to a daily unemployment allowance. ✦ It was started in 2000. ✦ The aim is to provide an adequate quantity of food to the BPL families identified by the government at highly subsidized rates. ✦ The aim of the programme is to create self-employment opportunities for educated unemployed youths in rural areas and small towns. ✦ They are helped in setting up small business and industries. ✦ The aim of the programme is to create self-employment opportunities in rural areas and small towns. ✦ A target for creating 25 lakh new jobs has been set for the programme under the 10th five-year plan. ✦ The programme aims at bringing the assisted poor families above the poverty line by organizing them into self-help groups through a mix of bank credit and government subsidy. ✦ Additional central assistance is given to states for basic services such as primary health, primary education, rural shelter etc.